The moment you buy a home and start its restoration, you realize how cheap and easy it is to own and operate a car. So why not just forgo the whole house thing and get a car instead? I'm sure a lot of you are thinking that if you're buying a car instead of a house, you should get some kind of all-terrain conversion van. Reader bpromersberger has a better idea, and it's all about a Zonda. If you have one chances are you'll be making lots of friends, friends that might let you crash at their place if you take them out for a drive. Essentially couch surfing in the most debonair of sorts. Some of you pointed out how easy it is to sleep in any five-door hatchback. But why settle for any old Mazda 626 when you could have a leather-lined, supercharged musclewagon? The truly intrepid of you may scream out for a more modern Type 3 Transporter, and you all have a point. When you dream of a stylish little bungalow, though, there's no better vehicular equivalent than a classic Type 2 Microbus. Ever since School of Rock rolled into theaters (or Supervan, depending on your age), you have wanted an old shag-carpeted band van to live in. Plus, if what you love about home ownership is doing your own paint, every '70s van is just screaming for mural treatment inside and out. Suggested By: Jonee, Photo Credit: Many thanks to Ken Palmer! Here's where things get really crafty. Reader TeejayHoward explains why a U-Haul (with a custom interior) is the undercover life car of choice. Enough room to stand up in, a place to sleep, and cheap enough that you can have it paid off in under a year on a minimum wage job versus a house which would take you 30 and a major salary bump. Really, you don't need much more than a "bedroom" and a gym membership. Shower/toilet/entertainment at the gym. Store your clothes and sleep in the car. Park somewhere with free WiFi and pull out your laptop, or use the internet at the local library. Clothes can be washed in a 5 gallon bucket and hung-dried, or you can use your local laundromat. Buy food when you need it, and only enough to eat. Cook it in the microwave you have in your van. (Alternately, eat out a lot!) Need electricity? Crank up the 4BT and let it charge your battery packs. The insulation you add in will keep you warm in the winter, and seeing an A/C unit attached to one isn't uncommon, so you're cool in the summer, too. Realistically, you could do this with most vans or camper'd trucks. I just like the box truck because of the privacy. Nobody knows what's in the back, versus someone looking through your windshield or rear windows in a van. Plus, you can park one just about anywhere without raising eyebrows. Just move it the next day. Donald Driver of the Green Bay Packers lived in a U-Haul, and you can too! Now we're getting into the meat and potatoes of the go-anywhere, do-anything vehicular home. It's a four-wheel-drive Ford van stocked with offroad equipment (kind of like the monster custom vans you see tooling around the frozen wastes of Iceland), but also stocked full of luxury fitments. Not bad. As an American I can tell you that more is more, and the Unicat Terracross is more better than any of the regular-sized van offroad homes. The Terracross 55 Comfort Plus follows basically the same formula as the Sportsmobile, only it's based off of an even bigger, beefier German MAN truck. It's an $850,000 amphibious motorcoach. Like, a motorhome that can ford rivers like you're some modern Oregon Trail pioneer. Only with less dysentery. Remember what I said about more is more and bigger is better? 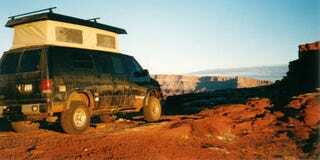 Yes, well the offroading KiraVan is the most biggest, most best RV. We called it the world's most advanced private expedition truck, Wired called it the most insane truck ever built. It's a gigantic Unimog with every high-tech gadget imaginable, with a build cost in the seven digits. Amazingly, the guy who owns the KiraVan built it just for his four-year-old daughter. Oh, you thought there was going to be some kind of offroader do-everything truck in the first spot? Hell no! You see, all those truck things get the whole 'living space' part of the home-ownership experience, but they miss out on the arguably more important investment side of the equation. Reader 4 cam torino explains. I talked about this when I bought my house in 2005. "If only the bank would give me a mortgage on a Ford GT instead of a house," I said. See? For the same price as a house, you could get a supercar and be fiscally responsible! Remember to double check your local exotic car dealer next time you visit your real estate agent. You'll appreciate it.